The Guray museum is a little treasure of exceptionally good ceramic pieces with a heap of information to them. Each piece on display at the museum is unique and handmade. The museum also fills you in with a bit of history and has a workshop where you can try your hand at spinning clay. 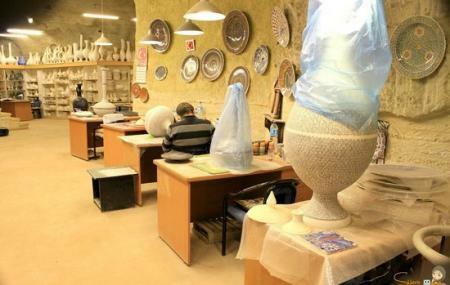 If you're into pottery and ceramics, you're bound to enjoy your visit here. If not, you'd at least love the rock carved building and beautiful displays. How popular is Guray Museum? People normally club together Kapadokya Jet Boat & Gondola and Sultans Ceramic while planning their visit to Guray Museum. We visited Güray Müze and upon arrival received a warm and friendly welcome. The underground museum is beautifully designed as a treat in itself. We had a look through the museum and gallery that showcased historic ceramic pieces and some modern art by local artists. We were then entranced by a pottery demonstration, where an artisan made forming a vase look effortless but I know it is not. Next was a browse through their shop, it had work by the ceramic masters and other ceramics varying in prices. I went home with a gorgeous plate by one of the esteemed Güray masters and other cheaper pieces. Everything we bought was wrapped and packed for safe air travel and we were again seen off with a smile. A great experience! Underground ceramics museum. Very interesting and a must see if you have the time. I am amaze with their collection and their arragement to show their collection.it is very worth to visit. Awesome glow in the dark room. Very comfortable and spacious.